That’s just one of the common exclamations I heard at the Cocora Valley, home to the 60m tall wax palm trees. Those guys were trying to take a photo of the national trees of Colombia and couldn’t fit them into their camera screen. Thank God for the widescreen on my Gopro. 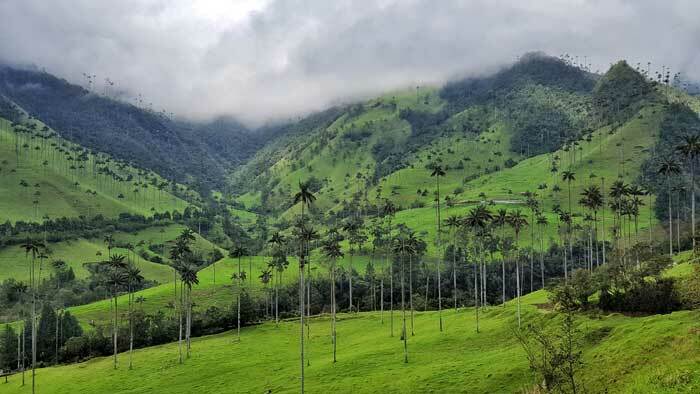 Hundreds of giant, slender wax palm trees fill the Valle de Cocora and it’s truly a sight to behold. 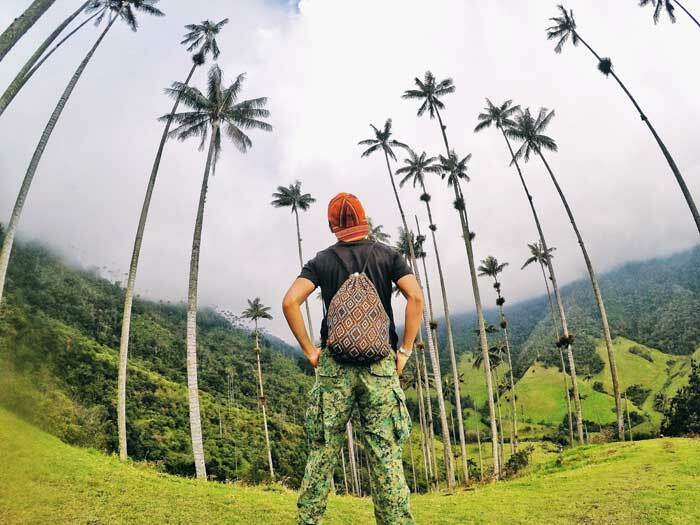 The magnificent Cocora Valley is part of the Los Nevados National Natural Park and one of the only places in the world to see the world’s tallest palm trees - wax palm trees - in their natural habitat. Most travellers who go there stay in the nearby town of Salento, a colourful, tranquil yet slightly touristic town, akin to Pai in Northern Thailand. 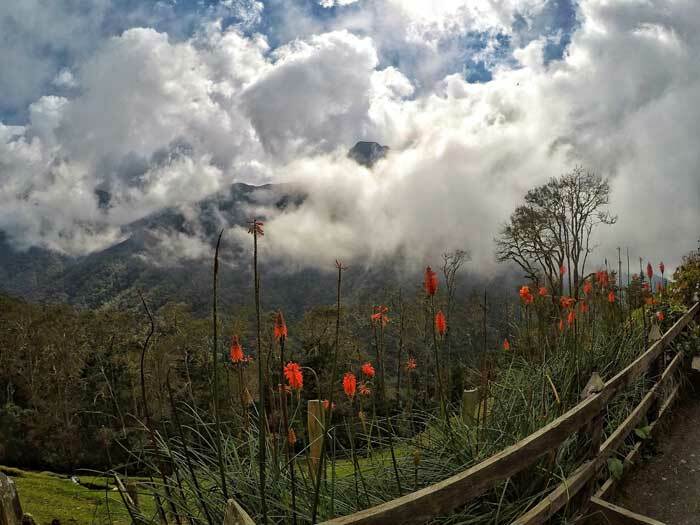 Salento is in the Quindio department, one-third of the Colombian Coffee Triangle (Eje Cafetero), along with Risaralda and Caldas. 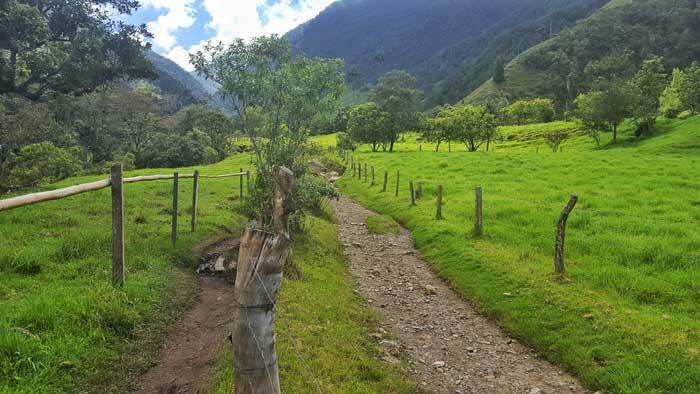 A couple I met on the Quilotoa Loop recommended the Cocora Valley hike, claiming it to be the ‘most beautiful place in Colombia’ for them. With such a claim, I got to check it out for myself! 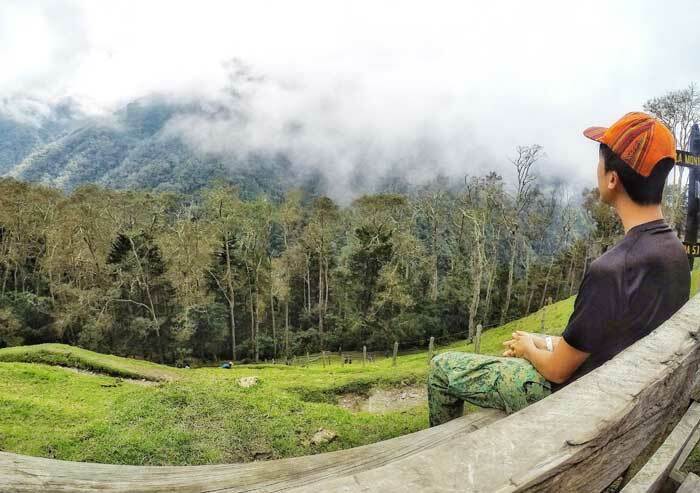 Click the image to learn more about the Cocora Valley tour. Getting to the trailhead was a simple and fun experience in itself. Lined along the main square in Salento are jeeps – locally called willy – that ferry tourists to and from the valley. The 20-30 min ride costs COP $3800 (Nov 2017) and leaves every hour (when full). 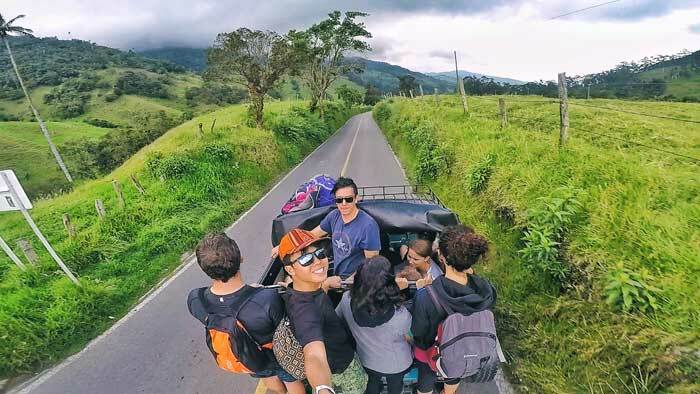 ‘Full’ is subjective in this case because even though the sitting capacity is only 8 pax, the willies usually carry 4 more people standing on the back bumper and holding on to the roof rack. Way to maximize earnings per ride! Once you get off at the entrance of the park, you’ll have to register your personal details because the palm trees in this park is a government protected species. It’s illegal to fell these trees. There are two ways to go: on the left is a short 1-2 hour way directly to the palm trees’ area; or on the right, a 3-5 hour full loop around the valley. I chose the long way; a hike is now my weekly exercise. The trail starts with an open valley walking on a muddy path. It isn’t long until you reach a park ranger collecting the entrance fee. This way used to be free a few years ago but now costs COP $2000 (USD $0.60), whereas the other way is COP $3000 (Nov 2017). A barbed wire separates the path: on the left is the muddy path for hikers and on the right for horses. I was amused that the path for horses was drier and sturdier. It did not rain that day but I could see how challenging it would be on rainy days. Note: You can rent boots at the shops at the entrance or in Salento. The open valley quickly changed to a dense rainforest, and I was surrounded by trees and lush greenery. 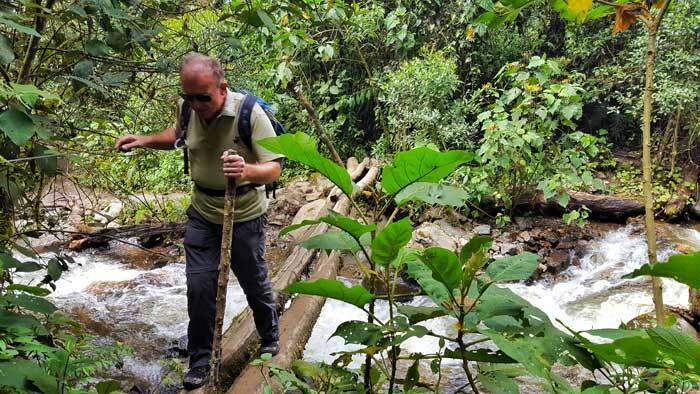 The trail follows a river, crossing several wooden bridges back and forth. At one point, the bridge is simply a thin wooden log and I saw someone literally crawling on it, trying fruitlessly to grab hold of the rock wall beside him. If you continue straight on, you’ll go to the Acaime hummingbird sanctuary, or Casa de los Colibris. If you take the left path, you’ll go up a steep route to Fincaa la Montana and continue down to the valley of palm trees. I went to the hummingbird house and regretted it. 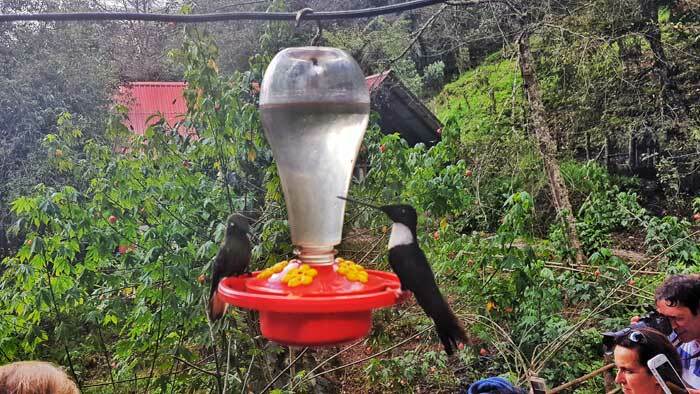 It’s an almost 20min hike, an entrance fee of COP $5000 (Nov 2017), a choice of soda, chocolate or coffee and a few different species of hummingbirds. I expected more from a sanctuary than some feeders and a few hummingbirds flying about. 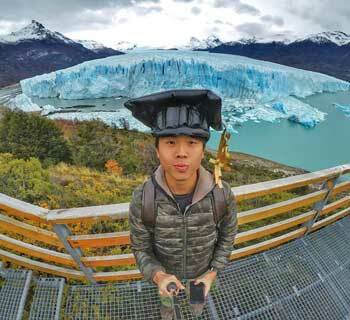 The place was filled with tourists holding their cameras in the faces of the birds. It was forgettable, although it was kinda cool to see hummingbirds up close. This is also a good place for lunch as they sell food and drinks. If you haven’t see hummingbirds before, I’d say go for it. Otherwise, skip it. It’s an additional 40-60 min walk. I took a wrong turn when I left Acaime and walked for almost 15 min up another trail towards Estrella de Agua before I realized my mistake. The path was marked periodically, but not clearly. Many hikers were confused if they were on the loop or the trail to the hummingbird house. Thank God for maps.me. 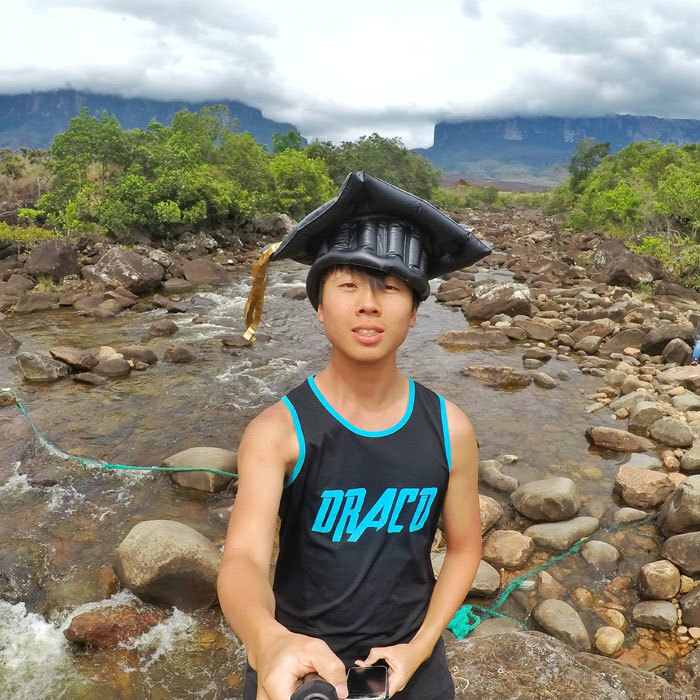 I backtracked till a river until I saw a group of tourists, asked for directions then went back on the right path. 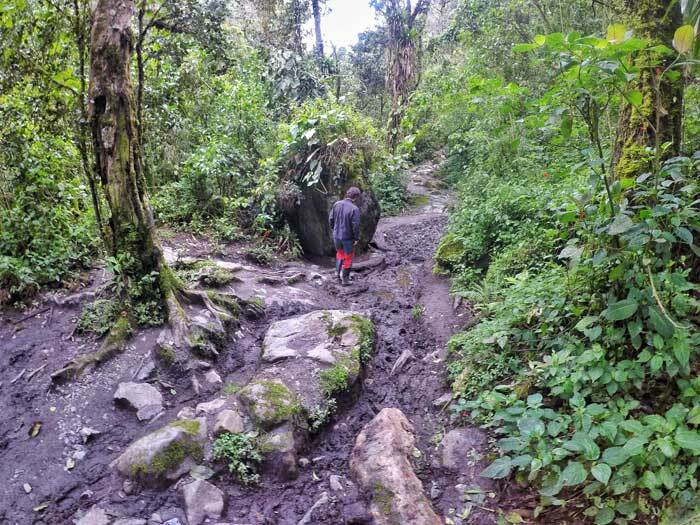 From here, it was a strenuous uphill climb to the viewpoint Finca la Montana. A ‘finca’ is a farmhouse and here they provided benches as everyone crowded around, had lunch and enjoyed the views of the cloud-covered forests. 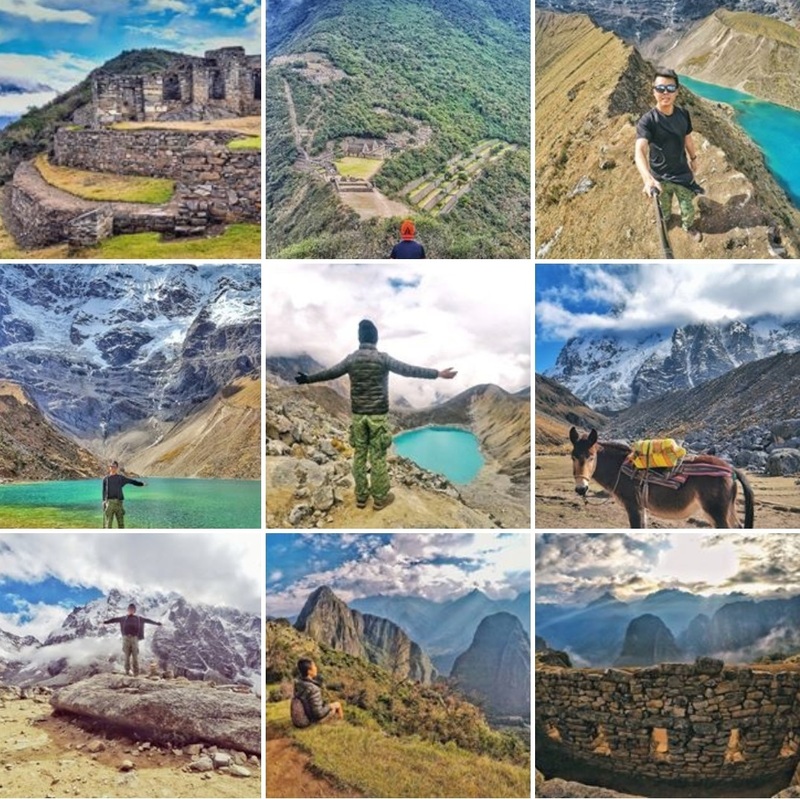 This was the only view worth it on the entire trek – coming from someone who’s seen incredible views in Peru and Bolivia. It’s also easier and shorter to get here from the other way and if I’d to do it again, I would do that and head back the same way. After a short break and a desire to get away from the throngs of tourists here, I left. From here it was a downhill walk to the grand finale of the hike: Bosque the Palmas - the clearing with the palm trees. "Cocora" was the name of a Quimbayan princess, daughter of the local chief Acaime, and means "star of water". 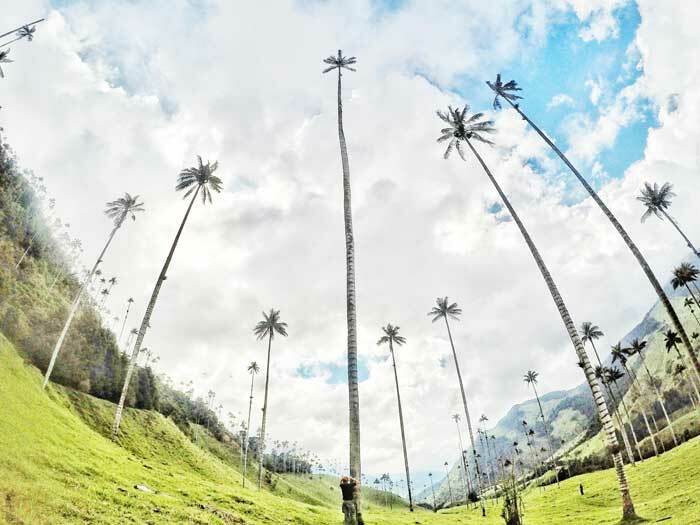 The Cocora Valley is a protected area and the wax palm trees are fittingly the national tree of Colombia. Walking up close and under the giant trees was surreal. The wax palm trees shoot up to 60m and are topped with a few palm leaves. People were tilting their heads up the whole time. It was like walking into a scene from a fantasy movie or a fairytale! Couples lay on the grass while cows feed a distance away. The low hanging clouds covered the mountains. It was a very tranquil and magical moment. From here, it’s a short walk through the farmland, past some shops and back to where you started. This short walk is the other way round. If you just want to see the trees and take your Instagram-worthy shots, this is the route for you. Unless you want the exercise, I’d recommend it. The views on the loop are not that great, the path is muddy, the uphill climb is strenuous and the hummingbird house is forgettable. To get back to Salento, take any of the willies along the entrance. The last ride is 5:30pm so be sure to start the hike early! People say it takes 5 hours to complete the loop but it took me 3.5 hours including the hike to the hummingbird sanctuary, almost 30min break and the wrong detour. I liked Salento. I came from dull and dirty Cali so Salento was a vibrant welcome. It is tranquil and colourful, although a little touristy. Besides Cocora Valley, you can play tejo at one of the shops near the center. Tejo is Colombia’s national game where you throw a piece of stone onto a clay area with folded packs of gunpowder. If you hit, they explode. There’s a points system but really, the thrill is in hitting the gunpowder and seeing fire goes up. Like I mentioned above, Salento is located in the Coffee Triangle and is one of the best places to visit a coffee farm. 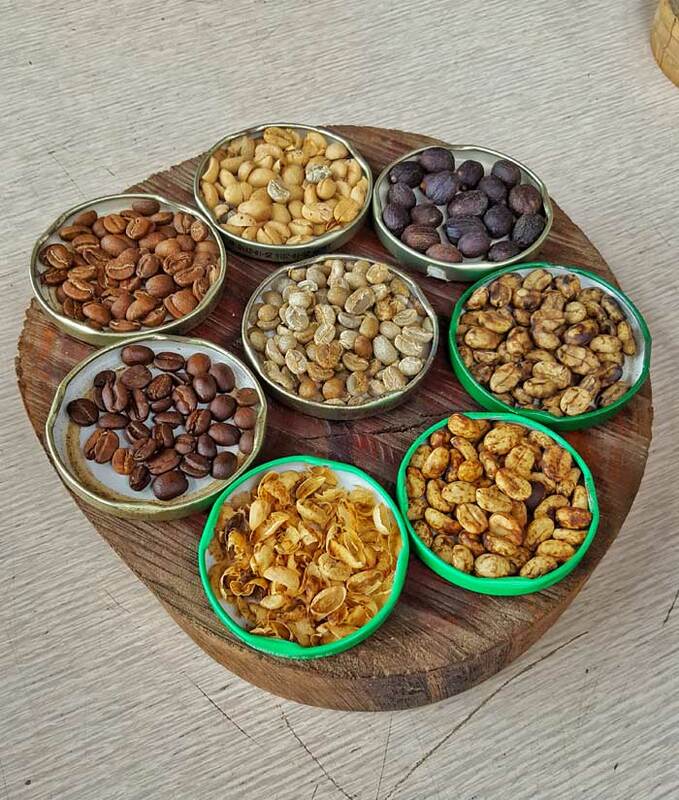 I went on a tour at Finca M﻿omota, 15min walk from my hostel, and was greeted by a very passionate and knowledgeable man who showed me the entire coffee making process: from beans on the plant to the cup on my table. If you like your daily cuppa and want to know what is a real good cup of coffee, I’d recommend paying him a visit. The only thing I didn’t like was the walk to his finca. That path was the muddiest and overall worst path I’ve ever walked in my whole life. Or simply click on any of these images for more details and availability. I stayed at Casa La Eliana which also doubles as a restaurant serving British-Indian curry. The curry is tasty and the restaurant is full house every night. Colombian food is pretty bland and always fried in general, so to have some spicy goodness is a nice change. Jesus, the owner of the hostel and restaurant, is a helpful guy who gave many tips about Salento. Check them out!